The Nintendo Wii game has a strong story and characters bolster the second in this game trilogy (New Beginning was the first installment). Also available on PlayStation 2, Nintendo DS, mobile, and Game Boy Advance (the latest ever European GBA release). This series has presented a lot of different formats over its considerable history. It helps to know the previous installment’s storyline, but the story stands up on its own well enough with increasing interest as you play. 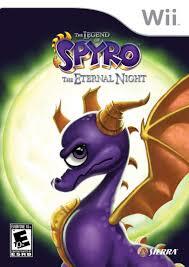 In this game, the little purple dragon, voiced by Frodo himself, Elijah Wood (Lord of the Rings), battles a formidable antagonist called Gaul, “The Ape King”. The supporting voice cast and the grand, cinematic-like scope are plentiful in this title. Gary Oldman (Harry Potter, Batman Begins) voices Ignitus while talented voice actor Billy West (Futurama television series) provides the vocals for Spyro’s sidekick and helpful navigation guide Sparx. The serious tone and challenging gameplay requires patience. The beginning/training sessions become frustrating at times, but later sessions are very simple, so hang in there younger players, don’t just immediately pass the remote to your older siblings/friends when the going gets tough. For example when Spyro hits an edge, he’s knocked back, which doesn’t really follow the physics of movement, so most players could get thrown off here. Spyro faces some very challenging odds, which definitely increases player emotion. Having a solid story boosts the emotion so players get a memorable experience. The formidable storyline includes some foreshadowing regarding Spyro’s mysterious premonitions involving lunar elements and the familiar wisdom-spewing older dragon who helps Spyro and players understand the story better offering some mild intrigue and decent subplots. Some of the graphics are too striated then other levels are very polished. Other high production values include sharp sound effects…maybe too sharp like Spyro’s clicking feet as he runs. Spyro might be small but he has several methods to beat even the biggest opponents including fury breath attacks of ice, fire, earth and electricity (remember Fifth Element? Just substitute electricity for wind). Spryo can even use time techniques to his advantage. “Dragon Time” lets Spyro win battles and tasks that normally would be impossible. Some of the game mechanics necessary to advance are very unique (original, puzzling, odd, etc. – you fill in the blank) like knocking enemies out of the ground then bashing them through a wall. Fighting with melee attacks get a little repetitive especially when you’re swarmed. Player choice of upgrade distribution can be challenging as well. Stock up when gameplay is easy so you have plenty of benefits for big battles. The numerous cut scenes are complimented by a subdued but effective musical soundtrack bolster the credible story even more. The game doesn’t take itself too seriously – some humorous dialogue, especially from Sparx, lightens the tone. Overall this title has decent gameplay in a format ideal for cinema (*** out of four stars). Players get three save slots, perfect for obsessed/experienced players who won’t quit until they’ve conquered the game. Players can unlock plenty of extras, such as art galleries, which adds some more incentive for game completion. It’s definitely not a one day game, most players will benefit for steady play with plenty of breaks (something the Wii promotes often). The ending creates a lot of excitement for the last part of the trilogy. This entry was posted in Video Game Reviews and tagged Legend of Spyro Eternal Night, Michael Siebenaler, Mike Siebenaler, Spyro, Tall Writer, video games. Bookmark the permalink.